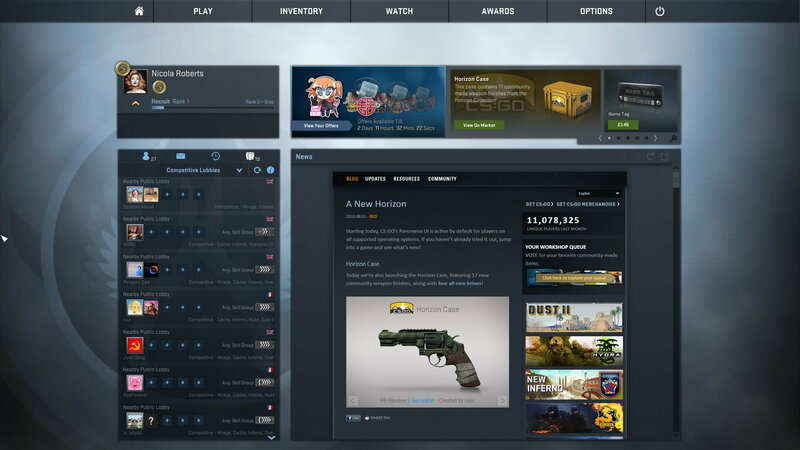 Valve have rolled Counter-Strike: Global Offensive‘s shiny new user interface, named ‘Panorama’, out as the default after weeks of public testing. It’s light, it’s colourful, and it stops the game feeling weirdly business-like. I like it! CS:GO’s style felt like productivity software pretending to be fun, and this feels like a video game. It’s not all sunshine, mind, as it may run worse on older PCs and some players have reported crashes. Players can currently opt-out of Panorama to return to the old UI, but that option will be removed. This prettiness does come at a price. The UI seems to be causing crashes for a few folks, and some players with computers scraping the bottom-end report they’re losing another sliver of their remaining playability. Such change isn’t new to CS:GO, as the game is on a constant slow cycle of updating with new shinies that demand more, from revamping vintage maps to replacing the arms. The game may have launched six years ago but it’s getting the ‘ship of Theseus’ treatment – good for those who do the same with their PCs, less so for PCs with six years of battle scars. For now, everyone can opt out of Panorama by adding -scaleform to the CS:GO launch options in Steam (right-click on the CS:GO entry in Steam’s Library, select Properties, click that “Set launch options” button, and enter it there, dash and all). This is only “for a limited transition time”, Valve say, so hopefully they fix some of the bugs before locking this in. You can see more of Panorama in this video from “HypeR_MK”, which is from the beta but it’s still basically the same and do you have any idea how few videos of this don’t have talking over the top? Tagged with Valve, Counter-Strike: Global Offensive.